Philippines President Rodrigo Duterte oversaw the destruction of 68 smuggled luxury vehicles and motorcycles on Monday in a province on Luzon Island. Duterte ordered the demolishment as part of his government’s anti-smuggling and corruption campaign, according to a press release from the Cagayan Provincial Information Office. Government videos of the operation were posted to Facebook. The clips show a large bulldozer driving overtop of Ferraris, Lamborghinis, Porsches and Harley Davidson motorcycles, crushing them under its tracks. The vehicles had been smuggled into the country from the U.S. Their combined value, CNN reported, was $5.5 million. 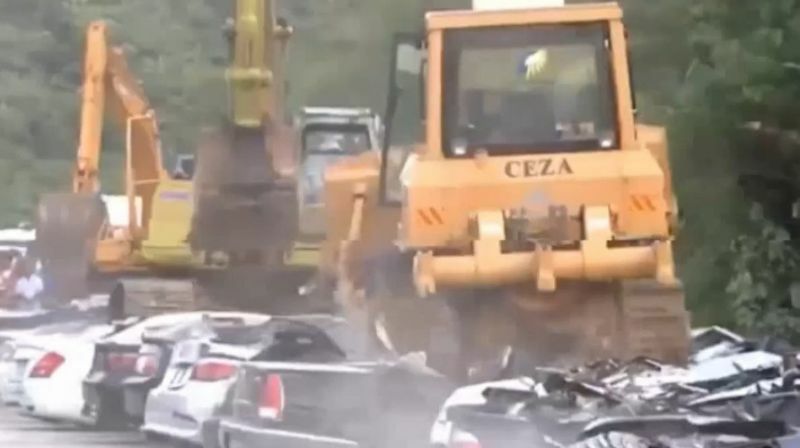 “Breaking up the contraband vehicles is the proof that these operations will not be allowed here in Cagayan,” Duterte said in a speech before the bulldozer started crushing the vehicles. According to CNN, a similar operation took place in February in which 30 luxury vehicles were destroyed. At the time, Duterte reportedly said it was better to crush the cars than auction them off and risk crime syndicates buying them under false identities. 0 Response to "Philippines President Duterte Orders Luxury Vehicles Worth $5.5 Million Crushed"